Halloween, the festival of candies, is one of the best time of the year for kids of all ages. It is celebrated every year on the 31st of October. Halloween is believed to have originated in Ireland. This feast is celebrated in several countries across the world. Halloween activities include costume parties, trick or treat, lighting bonfires, playing pranks and watching scary movies. The religious observers attend church services and light candles on the graves of the dead. 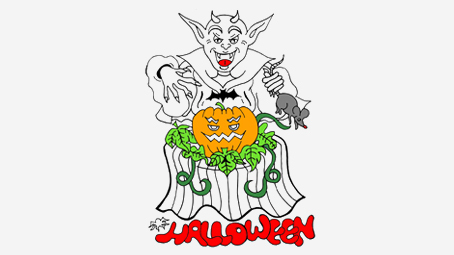 Halloween coloring sheets are an excellent way to get your kids in the spooky spirit. The article includes coloring sheets of Jack-o-lanterns, monsters, trick or treat, witches, haunted house and about everything that you experience on a Halloween night. It also includes various popular cartoon characters like Mickey Mouse, Garfield and Dora. 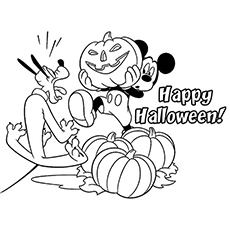 Help your child share Halloween greeting with coloring sheet featuring the message Happy Halloween in bold. This coloring sheet will help your child put his reading skills to use. 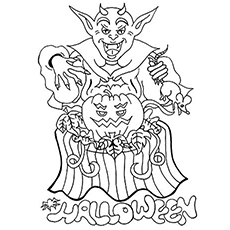 This coloring sheet is ideal for creating Halloween greeting cards. You can tell your child to color each letter in a different color. This will give it a unique look. Do not forget to make your young preschooler learn the spelling of Halloween. Ask him to trace the letter and then memorize the spelling. This Jack-O-Lantern is ready to glow at night. The only thing it needs is some bright colors. Have your child color this picture and then hang it for some extra Halloween fright. The silly and spooky expression of this lantern will surely bring giggles to your child’s face. As your child colors this grinning pumpkin, he will boost his motor skills too. Ask your child to review the shapes he sees in this coloring sheet. This wart nosed witch is soaring across the sky on her broomstick with her pet cat. It looks like she is on her way to some mischief. Ask your child where he thinks she is headed as he colors the sheet. Help your child to give this wicked woman some Halloween colors to complete her outfit. This Halloween coloring sheet will fill your child’s day with spooky, scary fun. Is it a cat dressed as a witch or a witch dressed as a cat? Either way, she is ready for the spooky night. 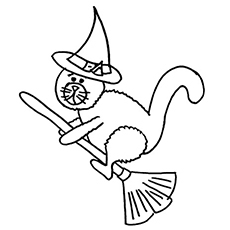 The diagram features a cute kitty dressed as a witch, riding on a broomstick. She is holding on tightly to the Jack-o-Lantern. Ask your child to give her some great colors to help her prepare for a fun night. This cute scene is not only a fun way to get your child ready for Halloween, but will improve his hand-eye coordination as well. 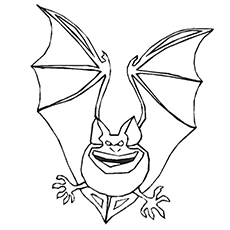 Help your child celebrate Halloween with this simple coloring sheet featuring a bat. Ask your child to give it a bit of color to make it look spooky. Your little Halloween monster will have a blast adding color to this bat. The coloring sheet can double up as a Halloween decoration too. Are you looking for a Halloween coloring page that is more cute than scary? Then this coloring sheet is perfect for your kid. This coloring sheet features two of the most iconic Disney cartoon characters of all time – Mickey and Pluto. Pluto is Mickey’s beloved pet. He is Mickey Mouse’s sidekick, best friend and even conscience on some occasions. Pluto is extremely loyal to Mickey but can get annoying and difficult to handle sometimes. This coloring sheet features the deadly Count Dracula. This vampire has sneaked through the graveyard and is looking for some fun. Will he join a zombie or a monster dance party or will he go to his hotel Transylvania? 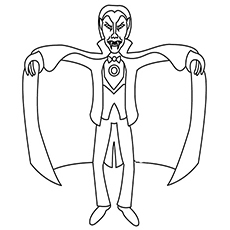 Ask your child to color this vampire and join in the fun. Count Dracula is the protagonist of the gothic novel “Dracula”. It is one of the most groundbreaking novels of all times. The novel has been adapted to many plays and films. You can also tell your child to add a background to this coloring sheet like some bats, owls or a haunted hotel. 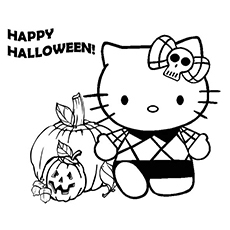 This is one of the Halloween coloring pictures that features the ever-popular Hello Kitty wishing you all a very Happy Halloween. 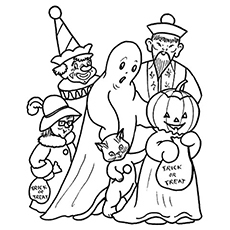 The coloring sheet also shows a spooky ghost and a pumpkin lantern. 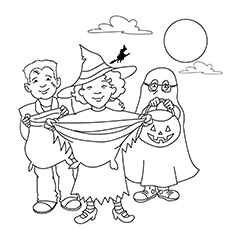 This coloring sheet is sure to get your child in the Halloween spirit. Hello Kitty is a Japanese doll created by a Tokyo based company Sanrio. She is a cheerful, bright and warm-hearted kitty who loves to bake cookies in her spare time. Look who has come to wish you all a very happy Halloween. This cute, little girl is Dora, the protagonist of the cartoon series “Dora the Explorer”. She is an adorable girl who embarks on a trip in every episode in order to help people. She is seen wearing a pointed hat over her regular clothes. Ask your child to use pink for her T-shirt, orange for the shorts and purple for the bag. Do not leave out the pumpkin lantern! Dora is a kindhearted girl who does not hold any kind of grudge against anyone. She loves and values her family more than anything else in the world. 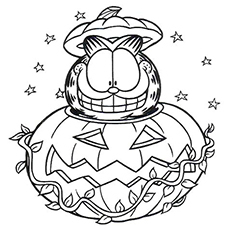 This coloring sheet features Garfield popping out of a Jack-O-Lantern. Both look extremely excited about Halloween. Increase their excitement by asking your child to fill some colors in them. Garfield is the protagonist and titular character of the comic strips of the same name. He has also featured in Garfield shows and film series. Garfield is an overweight, orange tabby cat noted for its laziness, arrogance, sarcasm and intense passion for food. Who said spiders are spooky? 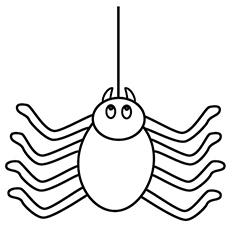 The coloring sheet features three spiders dangling from the web. These spiders look very cute with their wide eyes, furry bodies and crooked smiles. This coloring sheet is not just limited to Halloween. You can hand it to your child anytime he wants to have fun with arachnids. 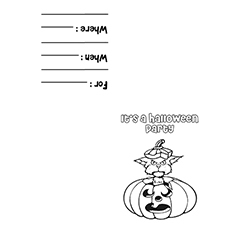 Here is a coloring sheet with the right amount of spookiness. 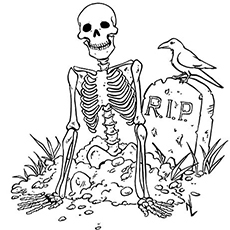 This coloring sheet features a skeleton sitting beside a grave while a crow looks on. It looks like he has just emerged from the grave. Ask your child to color this skeleton and his surroundings to mellow him down a bit. Celebrate the Halloween spirit with this ghostly coloring sheet. 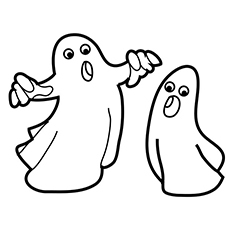 These two Halloween ghosts may look scary, but are actually quite friendly and looking for some color. Do not restrict your child to use white for these ghosts. Allow them to use a rainbow of colors for filling this sheet. Nothing says Halloween more than a haunted house. 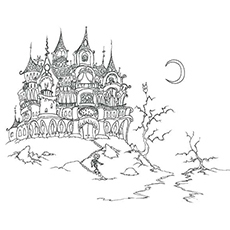 The coloring sheet features a spooky haunted house on top of a hilly graveyard. This haunted house is home to all manners of frights – from ghosts to owls and skeletons. Ask your child to bring this haunted house to life with his color set. 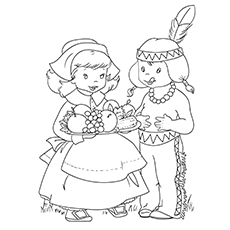 This coloring sheet is ideal for older children as it has fine details. After your child colors this eerie, haunted scene, cut it out and keep it on the table, mantelpiece or countertop until Halloween. Here is a spine tingling coloring sheet for your little one. 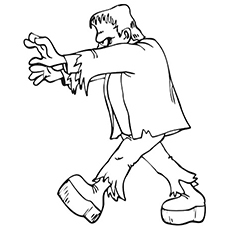 The coloring sheet features Frankenstein, the titular character of the book “Frankenstein”. It looks like he has made an escape and is now wandering around for some fresh targets. Ask your child who does he think will be his next target? Frankenstein is a monster. He is 8 foot tall with translucent, yellow skin, flowing black hair, black lips, white teeth and glowing eyes. Ask your child to make up a Halloween story to go with this picture. Its Halloween time and the monsters are walking in the night. This Mummy has escaped from the tomb and is now wandering to frighten and spook people. The idea might be a little scary but the coloring sheet is perfect to celebrate Halloween. 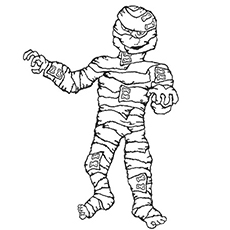 Let your child give this Mummy, in the picture, a different look by adding some bright colors to it. This will make him happy too. Here is an easy to prepare Halloween invitation card for your little ones. Print out this coloring sheet on card stock paper and then write the names of the invitees. Let your child do the coloring. This coloring sheet will help your child develop his handwriting skills while coloring the cat and the pumpkin lantern. This color by number coloring sheet has a spooky hidden picture. Tell your child to take out the browns, blacks, pinks, gray and blues to discover what it is. Make sure they follow the color guide. 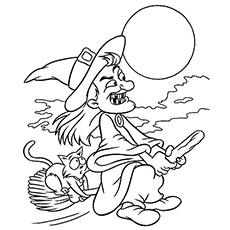 The coloring sheet features a witch accompanied with her surly owl, spooky bat and creepy cat. 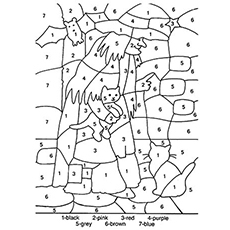 This coloring sheet with its small spaces will help your child with their fine motor skills. And not to forget, it is fun too. 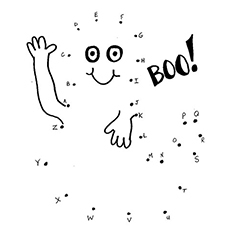 Let your child practice their reading skills by connecting the dots on this cute ghost. Tell your child to join the dots from A to Z to reveal the picture. This will help him learn the order of alphabets. These cute little kids are all decked in Halloween costume to attend the party. The boy is dressed like a tribal kid and the girl is dressed like a nurse. This coloring sheet, with its beautiful background will provide your child ample opportunities to display his artistic abilities. It might even get her thinking about how he or she would want to dress for the upcoming Halloween party. Celebrate Halloween with your children with this zombie-coloring sheet. These zombies need some color to complete their invasion. So ask your child to bring out the darkest crayons to color these scary zombies. Give your child a fun way to celebrate Halloween with this werewolf coloring sheet. 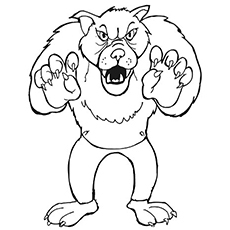 This coloring sheet features Larry the werewolf, the protagonist of the film “The Wolf Man”. This werewolf does not seem very monstrous. Narrate the story how he became a werewolf, as your child adds some colors to this wild monster. When your child is done coloring this sheet, ask him to create his own crazy story. This will stimulate his imaginative skills. If your child is not enthusiastic about Halloween parade, then this coloring sheet will surely get him in the mood. 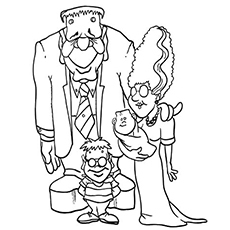 This coloring sheet features an enthusiastic family all geared to attend the Halloween parade. A Halloween parade is an annual parade or a street pageant presented on the night of Halloween in New York City. More than sixty thousand costumed participants, artists and dancers perform in this parade. 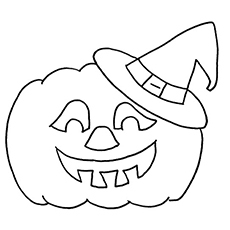 Give this printable coloring sheet to your child to get him in the mood for Halloween. 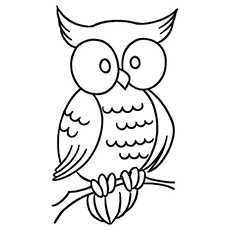 The coloring sheet features an owl having fun on Halloween night. He only needs some color. Can your child help him with it? Ensure he colors the twinkling stars and a shining moon. You can also narrate a spooky Halloween story to go with this character. Halloween is not just about ghosts and other scary creatures. It is also about candies, lollipops, caramel apples and other sweet delights. 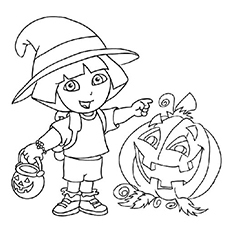 Get your child ready for a night of trick or treat with this cute coloring sheet. The sheet features three adorable children ready to knock the neighbor’s door. Trick-or-Treat is an activity popular among kids. The children dress up as ghosts or monsters and visit neighbors and relatives to get sweet treats. Print out these free printable Halloween coloring pages online to make an excellent holiday craft for your kids. These Halloween coloring pages printable are an excellent way to keep your children busy while you are preparing dinner for the guests. These Halloween coloring pages free to print are suitable for toddlers, kindergarteners, preschoolers and even older children. You can also use these as decorations. Hang them on the wall to give your house a spooky Halloween feel.